2016 Bultaco Rapitan Sport. Picture credits - Bultaco. Submit more pictures. The Sport version of the Rapit�n combines the high performance of a thoroughbred with a racing chassis.Rapit�n Sport is the urban interpretation of the Bultaco competitive spirit in the 21st century. Outstanding performance and striking looks, to enjoy and master the road. Comments: Bultaco Li-Ion type ESS battery with integrated BMS. Range 200 km. 1 hour fast charge, or 3-5 hour normal. Regenerative braking. Ask questions Join the 16 Bultaco Rapitan Sport discussion group or the general Bultaco discussion group. Bikez has reestablished Bikez.info motorcycle web shop overview. Here we present the major online shopping possibilities for motorcycle parts, gear and accessories. This includes customizing and insurance. Search and compare products and prices. 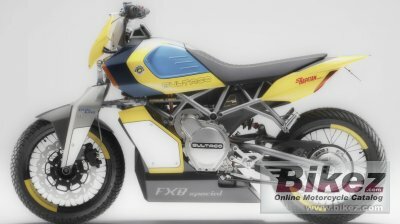 Try our 2016 Bultaco Rapitan Sport discussion forum if you have questions or comments. Information about any technical issue is always welcome.